James Allan ("Jim") Mollison MBE. Photo Siver-Snom / commons.wikimedia.org James Allan ("Jim") Mollison MBE (19 April 1905 - 30 October 1959) was a Scottish pioneer aviator who set many records during the rapid development of aviation in the 1930s. At the age of 22, Mollison became a flying instructor at Central Flying School (CFS), again setting the record for being the youngest in this role. Shortly after, he transferred to the RAF Reserve and devoted his time to civil aviation. 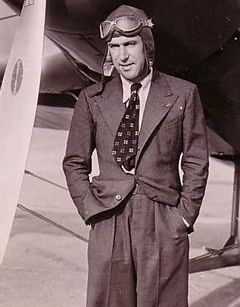 In 1928-29, he served as an instructor with the South Australian Aero Club in Adelaide, leaving that position to become a pilot with Eyre Peninsular Airways and Australian National Airways.